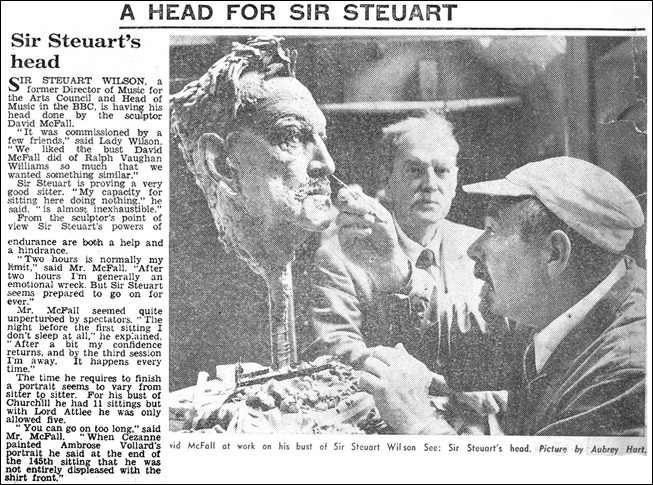 Sir Steuart Wilson (1889 - 1966) was a professional singer and administrator. Despite the loss of one lung and a kidney on the Western Front in World War One, he helped launch the famous English Singers madrigal group in the 1920s, and was for years in the front rank as a tenor soloist. He took a teaching post in America and subsequently held a succession of top administrative jobs: Music Director of the Arts Council at its inception in 1945, Head of Music at the BBC 1948-50, Deputy General Administrator at the Royal Opera House, Covent Garden 1950-55, and Head of the Birmingham School of Music 1957-60. 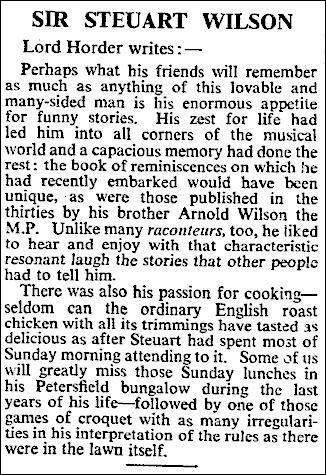 (1) "English Singer" The Life of Steuart Wilson by Margaret Stewart (Lady Wilson) published Gerald Duckworth London 1970 Includes a photograph facing page 257. (2) Lady Wilson: "We collected the bronze from David's studio on 15th December, and Steuart was overcome with joy and pride at it. 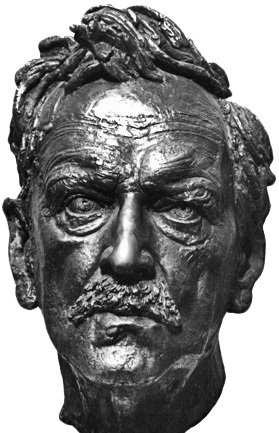 We planned to borrow the Great Room of the Arts Council in St. James's Square to 'launch' the head and honour the sculptor." 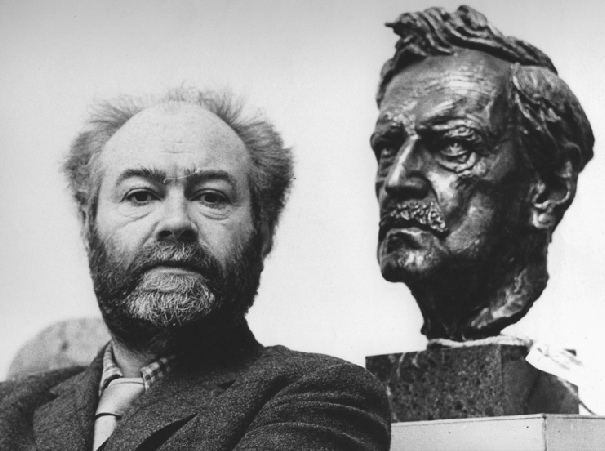 (3) David McFall recalled the sittings: "... a head like rock. It was deeply crevassed, sea-weathered and lit up from within by a brightness totally unsubdued by the ravages of time. A technical challenge for any sculptor. I set to work at once so as not to have time in which to contemplate the immensity of the problem. "... One morning he pronounced a motto with wicked relish. 'Fear no man, do right. Fear every woman, don't write.' This sitting progressed with bouts of hilarious laughter and resulted in the slightly demoniacal glint of mischief to be detected, I fancy, in the eyes of my bronze portrait head." (4) Evening Standard 25/7/66 page 6 photo of Sir Steuart with McFall & clay and story: "McFall explained ... "The night before the first sitting I don't sleep at all. After a bit my confidence returns, and by the third session I'm away. It happens every time." The time he requires to finish a portrait seems to vary from sitter to sitter. 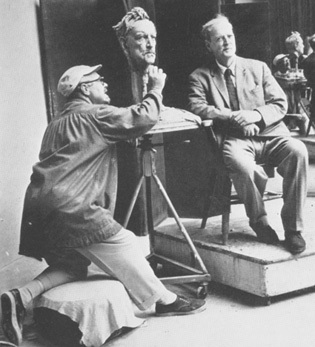 For his bust of Churchill he had 11 sittings [Ed: this is not so - 11 sittings were for the combined Roquebrune & Chartwell heads and the figure study] but with Lord Attlee he was only allowed five. "You can go on too long" said Mr McFall "When Cezanne painted Ambrose Vollard's portrait he said at the end of the 145th sitting that he was not entirely displeased with the shirt front."